Size: US 9.5 - 10 (mislabeled 8.5), heel 1"
I love these little sandals, and if they fit me I certainly wouldn't be parting with them. Unfortunately, though they are marked U.S. size 8 1/2 they are easily a 9 1/2 and may even fit a 10. 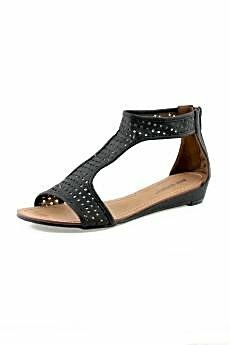 They feature a trendy perforated design and a T-ankle strap with a back zipper for easy on and easy off. I'm sorry to see them go but having a good friend who wears larger shoes, I know how hard it is to find cool ones in larger sizes so these should make someone *very* happy! Guaranteed authentic, 1 available.